In this bi-monthly column for The Tonic, Sarah Edwards from Copper and Cloves walks us through small daily changes that we can all make that will add up to significant, long-term lifestyle shifts. In her third column Sarah introduces a new next micro-habit to work into your life, as well as a recipe and little assignments intended to help you redefine your health. My first two pieces for The Tonic focused on how we eat rather than what we eat. To recap what I have been going on about - first, mindfully introducing a slow pace and a more conscious element to our eating, and secondly, eating for satisfaction and tuning into our hunger and fullness. The idea is that by building up and layering these habits, we increase the pleasure and satisfaction we get from food. There is a reason that when thinking about layering up healthy habits, the first few blog posts focused on building a healthy relationship with food through tuning into how we feel, noticing our inner beliefs and recognising the inner cues from our body, rather than focusing on what we should eat (because it is so easy to turn these into a rigid new diet). Of course, what we actually eat is important for our health, but until satisfaction, enjoyment, hunger and fullness are our primary drivers, integrating healthy choices into our diet tends not to be sustainable. The best thing about all this is that after practising enjoying eating according to what we feel like, including eating foods that might previously have been off-limits for us, we often find that we might lose our fixation on those foods and begin to crave a wider variety of fresh, nourishing foods. When we really focus on how we feel, before, during, and after eating, we can begin to notice that it feels good to eat healthfully. If we can let those good feelings drive our choices, it will feel a lot easier and more natural to eat well. So now, onto healthy choices! When I first started out on my Health Coaching training, I thought I was going to learn about the ‘perfect’ diet, the exact nutritional make-up of different food, and what foods we should never eat. What I have come to realise is that unless we are athletes, or have symptoms of a medical complaint or condition, we don’t need to worry about the detail too much. In fact, the stress around trying to eat the ‘perfect’ diet can have negative health consequences, particularly to our mental health, making the pursuit of optimum nutrition a pointless- or worse, damaging- endeavour. There is so much nutrition information out there, often focusing on the latest superfood or a new health claim of a specific type of diet. We might hear about the contrasting messages of paleo diets versus vegan diets and be really confused about what we should be eating. Instead of worrying about sticking to macros or the latest keto diet, we can focus on adopting small, simple healthy habits. Eating a wide variety of colourful plants is one the most impactful habits we can adopt. If we eat a wide variety of whole foods, and particularly a wide range of colours, we can be pretty sure that we will get everything we need. We know that adding more plants to our diets is associated with numerous health benefits. When we look at hundreds of studies together, eating a diet rich in plant foods is associated with better health outcomes including reduced risk of diseases such as cancer. We can feel confident of accessing the full range of different phytonutrients, vitamins, antioxidants and the different types of fibre necessary for healthy digestion by eating different plants of all different colours. We still don’t know the exact levels of phytonutrients we need, and these will vary from person to person. The truth is, we don’t need to worry about this percent and the number of grams of each vegetable, just aiming for as many plants and as much variety as possible will support our health. Taste and seasonality should guide our choices, we should always eat what we enjoy and what is appealing to us. But we can also aim to mix things up, be open-minded about trying new things and be aware of including a wide variety of colours that make up our weekly diet. Remember nutrition averages out over time, and it is not a big deal if we have a ‘beige’ day where we just feel like eating stodgy carbs, or if we are too busy one day to get a nice range of colours into our meals. This is not going to result in any nutritional deficiencies or health issues. We should aim to be regularly eating between 5-10 portions of fruit and vegetables a day- again, not a hard and fast rule, our diet is bound to vary day to day. Over the course of a week or month is the length of time we want to examine whether we are generally eating fresh, colourful produce regularly- rather than freaking out over meals or even days. It can be tough to get all those fruits and vegetables in, so here are some tips below to help us get more colourful fruit and vegetables into our diet, focus on bringing in the most manageable small changes first rather than seeing the steps below as a chance to overhaul! 1. Try one new vegetable or fruit per week. It’s easy to get stuck in a rut with what we buy and prepare each week. Whether you cook or someone else does the cooking, try seeking out a different coloured vegetable, like pumpkin, beetroot or red amaranth (something that isn’t normally part of the weekly repertoire), and incorporating this into the weekly menu. Simply stir fry, roast or chuck it into a mixed vegetable curry. Or you could try creating your own salad by following my easy steps to building ‘a modern Indian salad’ at the bottom of this feature. 2. Whenever you are cooking a meal, try to think how you could add a new colour to it. One of the easiest ways to do this is to have spinach, methi leaves or amaranth leaves in your fridge so you can add greens to any dish- stir them through any curry gravy right at the end of cooking, add them to a sabzi and you can even add them to scrambled eggs or an omelette. The same goes for frozen peas- they can be stored forever without going off and can be added to so many dishes at the last minute without careful planning. 3. Herbs and spices count! Adding fresh coriander or mint leaves, cooking with turmeric, ginger and garlic all add to the variety of phytonutrients you get! 4. Mix up your breakfasts. It can be easy to get stuck in a rut with breakfast- and whilst there is nothing wrong with cereal, toast or idli, breakfast can be a really colourful affair! · Top your toast with chopped tomato and mint leaves with a drizzle of olive oil. · Cut up fruit and nuts and sprinkle over your porridge or cereal- banana, strawberries and flax seeds are a great topping. · Take your masala omelette to the next level- rather than just tomato, onion and a little chilli, add fresh greens, grated zucchini or peas into the mix! · Pack your sambhar full of vegetables. So often it is a watery soup with a few vegetables floating inside- try to flip the balance by stuffing it full of gourd, drumsticks and tomatoes as well as any other vegetables you have lying around. 5. Have a fritter or rosti instead of toast under eggs once in a while. Grate beetroot, potato, onion and carrot (or just one or any combination of these) into a bowl with some salt, pepper, and one whisked egg. Add a teaspoon of jeera seeds and some shredded fresh coriander. Mix well- then take a tablespoon, roll into a ball with your hands and then flatten. Fry in some hot oil until the edges start to go crispy on one side and then flip. These are perfect topped with poached, fried or scrambled eggs for a light dinner, or topped with hummus or my smoked aubergine dip (see recipe here). I hope these tips are helpful, actionable steps to including more colour in your diets. The key thing to remember is, having a healthy relationship with food is as important as eating healthy food. Don’t allow aiming to eat as many colourful fruits and vegetables become a rule that causes anxiety as you strive to meet it or causes guilt when you fail to meet it. Start where you are- if you currently think you eat a very limited range of colours, think about how you could eat just one additional colour a couple of times per week and build up from there. Adding more colour should be a fun and happy endeavour! Here is a recipe for what I call a ‘modern Indian salad’- I’ve learnt that, in Indian cuisine, salad often means sliced raw carrots, tomato and cucumbers eaten alongside curries and sabjis and whilst that can be wonderfully refreshing, this type of hearty, filling salad can be a meal in itself. There’s no iceberg lettuce in sight either- it is colourful and filling, with contrasting flavours and textures. 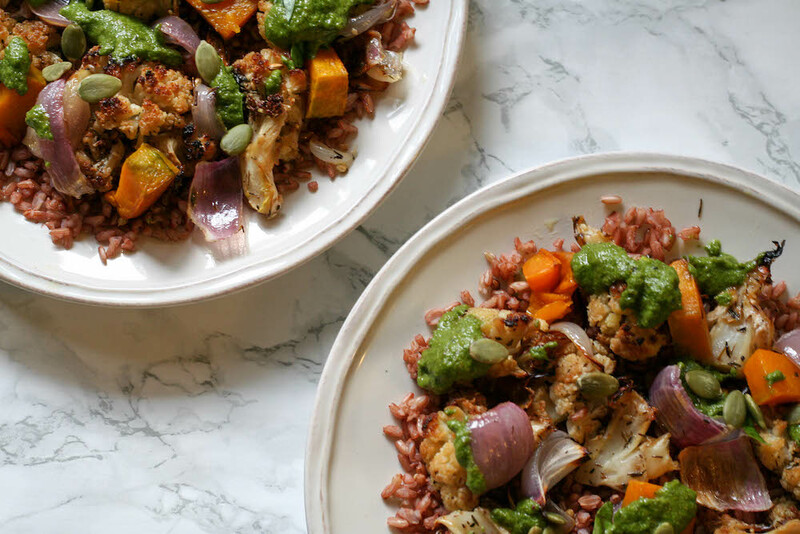 This salad is made up of vegetables roasted until caramelised, on a bed of red rice with coriander seeds and lots of herbs. It’s totally customisable too, so you can change the vegetables around according to the seasons. When sweet potatoes are in season you can roast them in their skins instead of pumpkin, and you could swap roasted brinjals for the cauliflower. Instead of red rice, you could use black rice, brown rice or millet. The herby pesto dressing here has basil and mint to compliment pistachios, but you could swap pistachios for pumpkin seeds or almonds and include coriander instead of basil if you prefer. To add some protein, top with a poached egg or some grilled chicken which could also be marinated in a little of the pesto before grilling or pan-frying. In the meantime cook the rice until it is just cooked and still has a bite. Start by rinsing the red rice in water and draining, then heat a teaspoon of oil in a pot, add the rice and stir for 2 minutes. Add water and bring to a boil. Once boiling, lower the heat and cover the pot. Cook for around 45 minutes- then check to see if it is cooked al dente. Remove from the heat and let it rest until everything else is ready. Next make the pesto! While the rice is cooking add all the ingredients into your blender and blend until fairly smooth and the nuts are broken up. Adjust salt and pepper as per your preference. You can add more oil to make it more pourable. Once the vegetables are done, stir the red rice through the tray of roasted vegetables. This is very important because the rice will absorb the lovely cooking juices and flavours and this will give it flavour. Stir through the fresh mint leaves. Serve out onto two plates and drizzle the pesto on top, and finish with the pumpkin seeds.